The Gunter brothers are what you might call ‘laconic.’ The word means “using or marked by the use of few words” and it accurately describes Harry and Dennis Gunter’s demeanor during our interview for this article. Don’t get me wrong—they are friendly, courteous, and helpful. They smile easily, and they obligingly dig out yellowing back issues of The Rural Shopper newspaper for me so I can read stories about their grandpa, who founded Gunter Meats in 1932. And they seem to be genuinely enjoying the interview. However, they don’t give me a whole lot of quotable statements. After a while I ask, “I can see that you guys are pretty laid back. But I am sure that you have some passion for running this business. Can you tell me about that passion? What do you love about this work?” Usually, once I touch into the passion, I’ve found the heart of the story I’m going to write. The brothers look at each other, grin, look away, think a bit, then look at each other again. Hmm… nice, but I’m not picking up passion. I was hoping for something a bit more… effusive. Oh well. “Yes, it was really interesting,” I say. All traces of shyness dissolve, replaced by a smile and a light in her eyes. She wants to know if I’m going to look at the Gunter farm next door, and the new compost facility, so that I can see the whole process, literally from farm to table (and from farm back to the earth, in the case of the compost facility, which transforms waste from animal carcasses into nutrient rich compost). To say that Gunter Bros. is a family business is an understatement. It was founded by Harry and Dennis’ grandfather, making Sheldon the fourth generation to be involved. Harry, Dennis and their six sisters grew up enmeshed in the farm and meat processing business. Their sister, Kathy Beaton, currently runs Stonecroft Farm in Merville, with the help of her son and grandchildren, raising heritage turkeys (their bloodline traces directly back to Grandpa Gunter’s very first turkeys) which are sold through her brothers’ outlet. Dennis and Harry’s parents handle all the livestock. Their father, 80, does all the feeding. “It’s a big job,” says Dennis. The family business roots reach right back to Gunter ancestors in Hertfordshire, England. The Canadian Gunter Bros. Meats was founded by Harry Gunter, Dennis and Harry’s grandfather, who was trained as a butcher by his grandfather in England. Dennis explains, with a grin, how his Grandpa ended up in BC: “My grandfather, he liked to drink and party and have a good time. He decided to travel and see the world. He went to Australia and then to Hawaii, where he…” Dennis lets his voice trail off, leaving the completion of the sentence up to the imagination. “They said to him, ‘Canada is your nearest destination, get on that ship and get outta here!’ Or so the story goes. “He landed in Vancouver. The first job he got was peeling cedar poles in Fanny Bay. He always wanted to get into farming and eventually bought this farm,” says Dennis, gesturing with his head toward the view of the Gunter farmstead out the window of his office. The business grew slowly over the decades. In the 30s, Grandpa Gunter started an on-farm slaughter operation for his own animals, and in the 40s and 50s, he expanded into turkey farming, with 10,000 turkeys. In the 60s, the family built a commercial slaughter facility for beef, pork and lamb and started doing custom cutting work. In 1979, Bob Gunter (Dennis and Harry’s father) built the processing plant that since has expanded to become the Gunter Bros. we know today. The Rural Shopper, a now-defunct monthly publication that served the communities of Black Creek, Merville, Oyster River and Ocean Grove, contains plenty of colorful stories about the Gunter family’s farming life. For instance, Bob Gunter wrote about how his dad Harry got into turkey farming: “In 1933, he borrowed a rifle, shells and money from Tommy Baker, owner of the Tsolum Store, and entered a local turkey shoot contest. “Being as expert shot, he won three scrawny turkeys. The birds were too skinny to butcher, so Tommy said to keep them to fatten up, and pay him back with turkeys next year,” he writes in the November 15, 1997, issue. By the next year, Grandpa Harry had a flock of plump turkeys hatched out of the original three scrawny hens. He paid back Tommy, sold some for cash, and kept the best parents for breeding. A few years later he had built up a pure line of Broad Breasted Bronze, and was shipping turkey poults all over Canada and the US, and even to England to help rebuild stocks after WWII. Bob writes how, over the years, he had to seek far and wide for suppliers of Broad Breasted Bronze stock, which weren’t available from commercial hatcheries. Unlike the more common White Turkeys, this heritage breed can mate naturally rather than needing artificial insemination, he explains. But more importantly, they provide tastier and finer-grained meat, and are hardy enough to withstand BC coastal winters and so can be free-ranged all year round. “All were kept outside in the fields and bushes all winter, through rain, hail, and snow. That’s what I call a turkey!” he writes. He also shares the tale of how his sister fell head first into a barrel of curds and almost drowned. Such is the farming life. “They learned to accurately judge an animal’s condition and dressed weight. They were taught how to safely use a gun, then how to hunt game, gut it and skin it, and above all, keep it clean. Gunter Bros is a multi-faceted operation that employs approximately 25 people. They slaughter, process and package livestock and poultry of all kinds. They also cure and smoke meats both to create their own products and for clients. As well, they serve a wholesale function, liaising with markets and then processing and shipping Comox Valley meat to food distributors throughout BC. 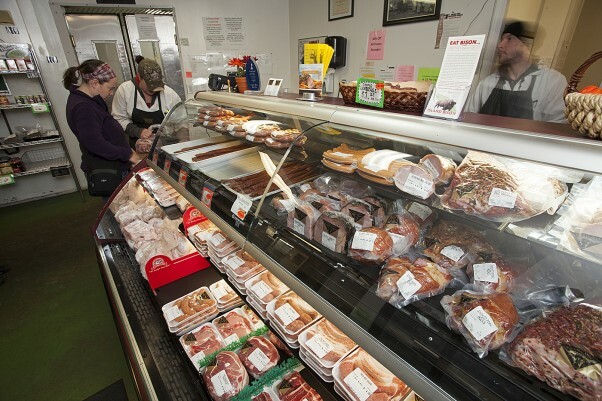 And their on-site retail outlet sells fresh meats as well as their own bacon, pepperoni, cold cuts and sausages. Just like ecosystems are said to have a keystone species, you could say Gunter Bros. is a keystone business for the local farming community. “It’s good for the local economy because we draw people and so they bring their business here, spending money in the Valley. And all the farmers’ market meat comes through our facility,” says Dennis. Running a business like this requires long hours, and is physically demanding, say the brothers. And of course, it demands good business sense. I ask the brothers what business principles lie behind Gunter Bros.’ long lasting success. “We just stay steady,” says Dennis, summing it up in four words. Clients also appreciate that Gunters is a small-scale meat operation that has a hands-on approach to every step of the process. “What we do in a year, the big operations do in one shift,” says Harry. “So we do about 1,000 beef in a year, whereas, say, Cargill [one of North America’s largest abattoirs] does about 4,500 a day! It means we aren’t just pushing stuff through. Our control of safety issues is a lot better because we are a small facility. We have a government inspector on hand five days a week. In big plants he’d have 30 to 60 seconds per animal. Here he has closer to an hour,” says Harry. I ask the brothers if they have any particular plans for the future of Gunter Bros. Their answer, not surprisingly, is brief and to the point. “We’re going to keep working hard,” says Dennis. “Keep the business going,” adds Harry. And that’s all they’ve got to say.